This post is sponsored by Target. More Transformers, More Than Meets the Eye: Blur the lines of fantasy and reality with your favorite Transformers at Target. In August, my five-year old son Augie will be leaving his preschool and heading off into the big world of kindergarten. He has attended his tiny little school for the last three years and the seven kids in the pre-K program are a close-knit group. When they go to kindergarten in a few weeks their little group will not be moving on together. They’ll be spread across four or five different schools. We’ll be able to arrange occasional playdates with his friends, of course, but the daily games of tag and Lego building sessions will come to an end before they know it. 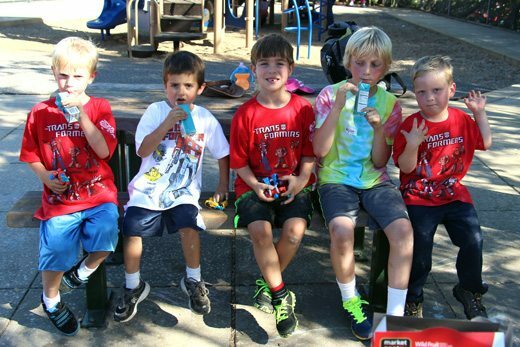 I wanted to give Augie and his preschool buddies one last big, fun, super playdate before summer comes to an end. 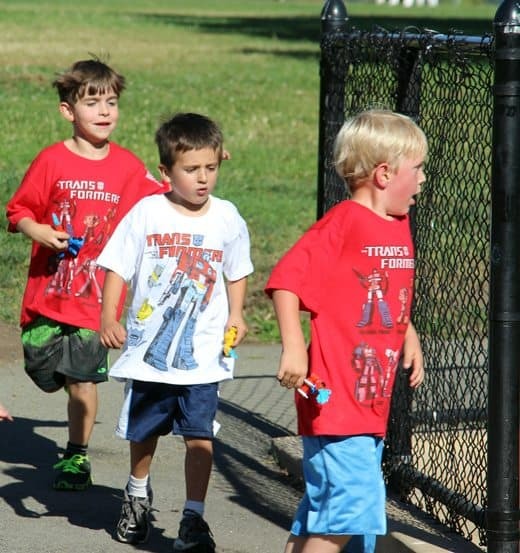 A chance to run around, laugh, shout and really cut loose together as only a group of five-year-olds can. I wasn’t going for a full-on party, but I was hoping to pull together a small celebration, something beyond an everyday run around our backyard. 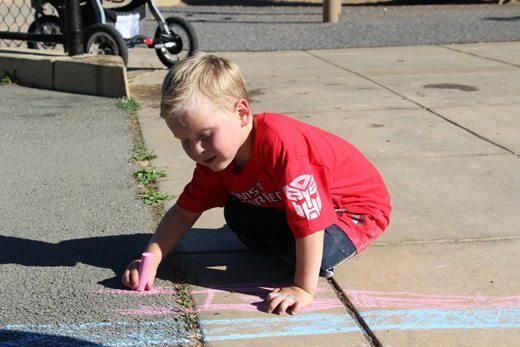 The goal was to make it easy and low-stress so I emailed his friends’ parents inviting them to join us shortly after preschool pick-up at a park that’s just a couple blocks from the school so people could walk over or stop by on their way home. I picked up all my supplies at Target on the day of the super-playdate. The kids are all ga-ga for Transformers and they’re transforming into kindergartners, so I started with that theme and ran with it. 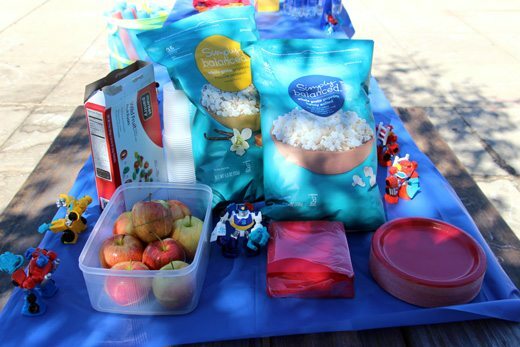 I grabbed red and blue tableware (to match Optimus Prime), a few bags of popcorn, fruit snacks that looked like wheels and a big bag of apples. My kid is always starving after school, so I knew snacks would be crucial but I kept it light because I didn’t want to be the mom who ruined everyone’s dinner, either. 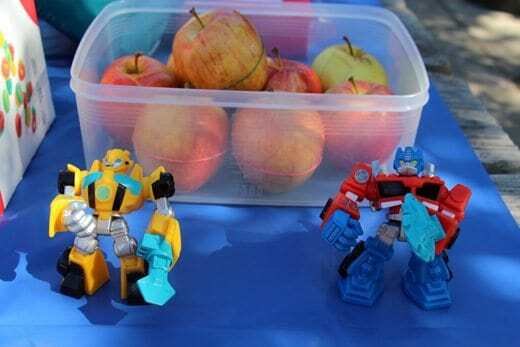 I also grabbed a bunch of small Transformers toys to decorate the table and so the kids could each have one to play with and take home in lieu of a gift bag. Augie helped my set up by arranging them down the length of the picnic table we’d staked out. Bonus: they kept the table cloth from blowing away. More than meets the eye, indeed! 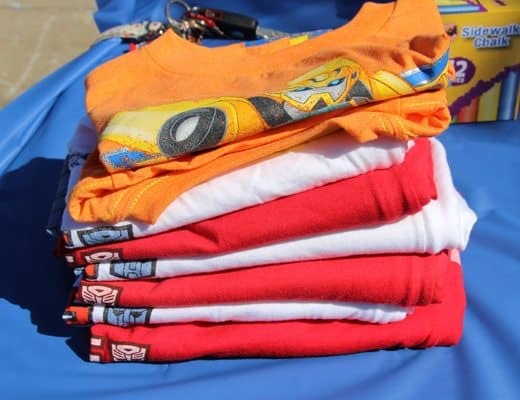 My big splurge was a stack of Transformers t-shirts — one for each preschooler and for the little brothers and sisters who came along too. The kids were thrilled to have matching shirts. They loved picking which color shirt to wear and as they ran around they looked like a little club. Hopefully it will serve as a memento of their time together in preschool and the kindergarten adventure that waits ahead. Have you noticed how many times I’ve mentioned running? It’s because that’s what they did for almost the entire time they were together. 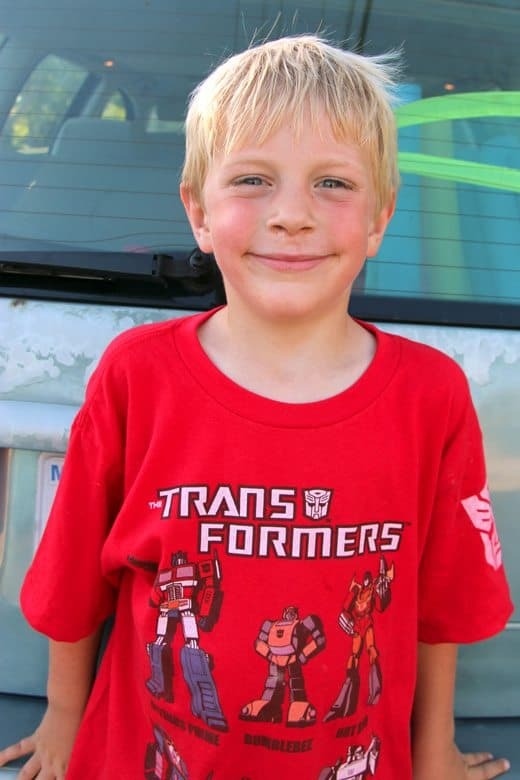 As each boy arrived my older son helped him choose a Transformer from the table and helped him get situated with a t-shirt. And then they took off! 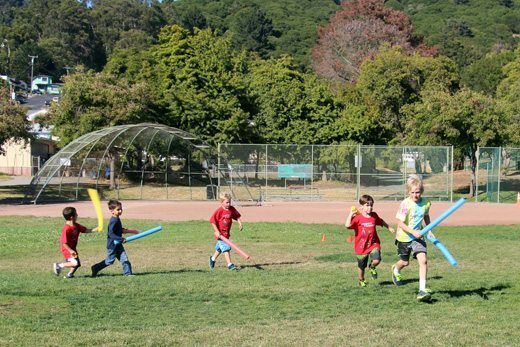 They ran all over the park, back and forth across the soccer field, around the play structure, in between picnic tables. For a full half hour, the other parents and I marveled at their stamina. 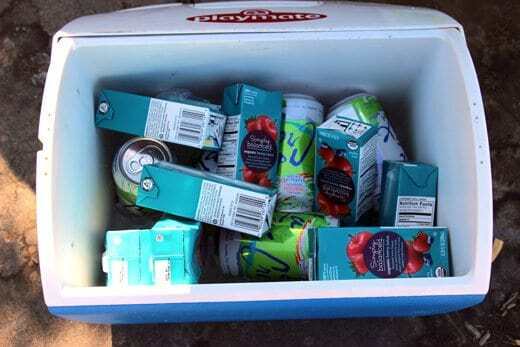 When we noticed that they were getting pretty hot, we insisted they take a break for some juice and a cool down in the shade. 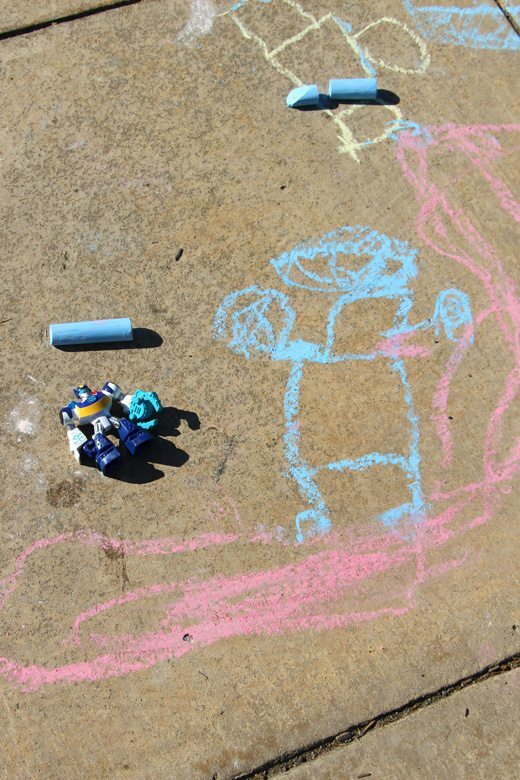 I broke out a box of chalk and they all got down on the ground and drew their favorite Transformers. I thought this likeness of Chase, the police Transformer was particularly good. I had initially planned to have the kids do a craft project, but as I was walking the aisles of Target, I realized that getting a group of young kids to sit still at a playground was going to be nearly impossible. 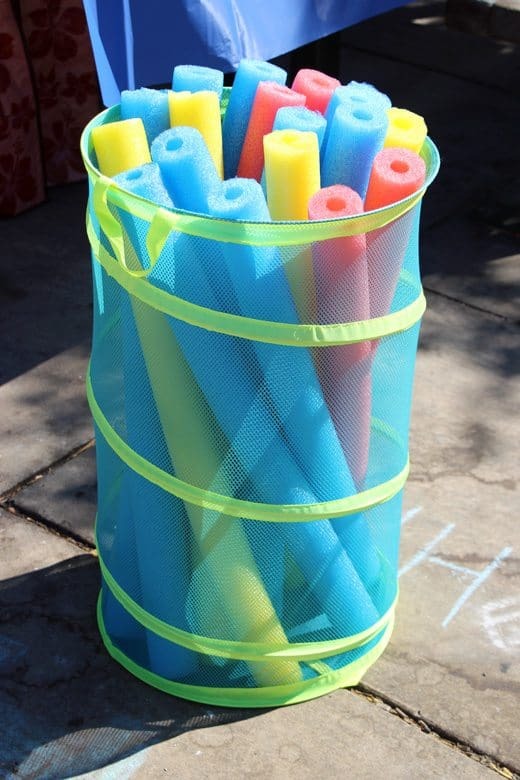 I decided that pool noodles would be great for the kids to use as robot arms. They were a little long to manage easily, so I cut them in half before bringing them to the park. I was surprised that the boys didn’t notice the giant bin of noodles until I pointed them out, but once they did they were all over them. 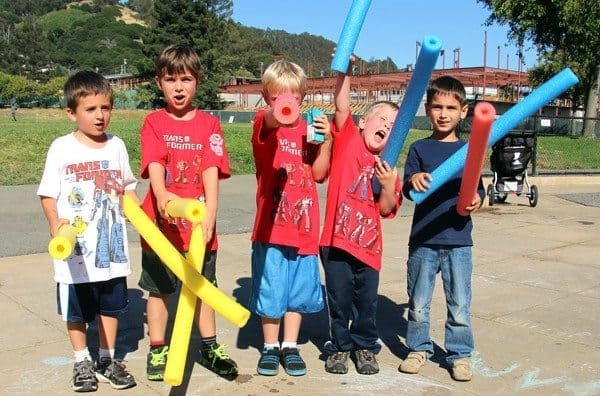 At first they were content to wave them around and yell, but pretty soon they realized they are super fun for bonking your friends with. Yup, an instant crowd pleaser for the kindergarten-set. Even more fun? 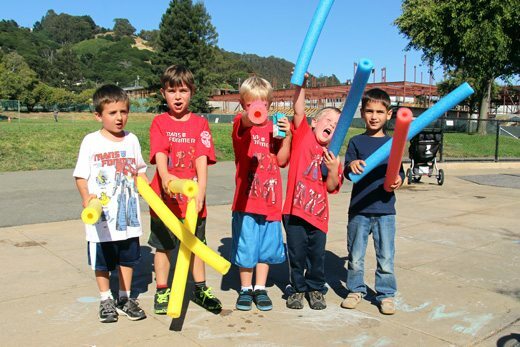 Chasing the big brother in attendance and bonking him with pool noodles! The kids ran and played. The parents chatted. Clean-up took 5 minutes. 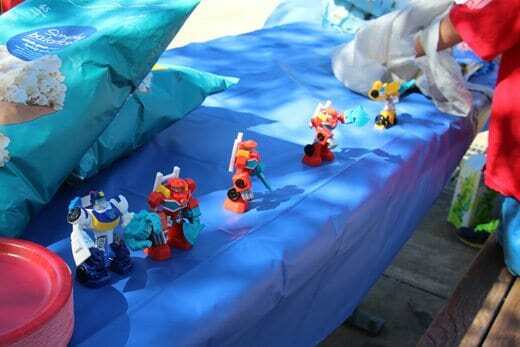 And a group of good buddies who are transforming before my eyes had a celebratory last playdate together. Wendy Copley is a cook, writer, crafter, lunch-packer, wife and mom. Whenever she goes too long without doing something creative, she starts to lose her mind, so she’s always working on some sort of project. Her focus frequently shifts from sewing to baking to paper-crafting to creating with her kids but she is unwavering in her devotion to packing cute, mostly-healthy bento box lunches for her two boys. You can follow her adventures on her blog Wendolonia or you can learn all her lunch box secrets from her book, Everyday Bento: 50 Cute and Yummy Lunches to Go.